One of the biggest news items this February was without a doubt the collaboration between Google’s robotics division and Taiwanese design manufacturer Foxconn. Although this has been developing since last year, it was a hot topic in this month’s Wall Street Journal and was featured on Robohub in mid February. Google and Foxconn say they will work together to test and develop Google’s robotics technology, ultimately aiming for a robotics operating system that would make Google a major player in the technology industry. Robotics industry news was generally good all-round in February, as the IFR released its final figures for the 4th quarter of 2013, showing an overall increase in robot sales compared to 2012. Also came the positive news that robotics is the fastest growing industry in the world and that demand for people with robotics skills is on the rise. In echo to the positive news of this recent growth is the investment this February by vacuum cleaner giant Dyson of £5 million (approx. $8.4 million US) in a new robotics laboratory at Imperial College London to advance the science of robotic vision systems. We also saw lots of news items about drones this month – including a controversial dispute between US Police and a Hartford journalist who used an aerial drone to take images of a car wreck. The story was featured on ABC News and sparked new interest in the discussions about regulation of drones by the Federal Aviation Administration, and renewed the drone journalism/privacy debate. Drone use for sports photography was also a hot topic this month, especially because of the Winter Olympic Games in Sochi, Russia, that saw a number of drones being successfully used particularly in the downhill ski and snowboarding events. It’s no surprise that use of drones for documenting sports events is likely to increase in the coming years. In line with all the buzz about drones, the Drone User Group Network launched its drone competition, the Drone Social Innovation Award this month, with a top prize of $10,000 US for the most exciting and innovative ideas for social or civil use of aerial robots. In other news this month, the SAE International On-Road Automated Vehicle Standards Committee helped to shape standards for the automation of vehicles by defining six levels of driving automation, and the US government announced that it will run the first ever White House Maker Faire later this year to foster the “inventive spirit across the US“. Details of the event will be publicised later – watch this space! 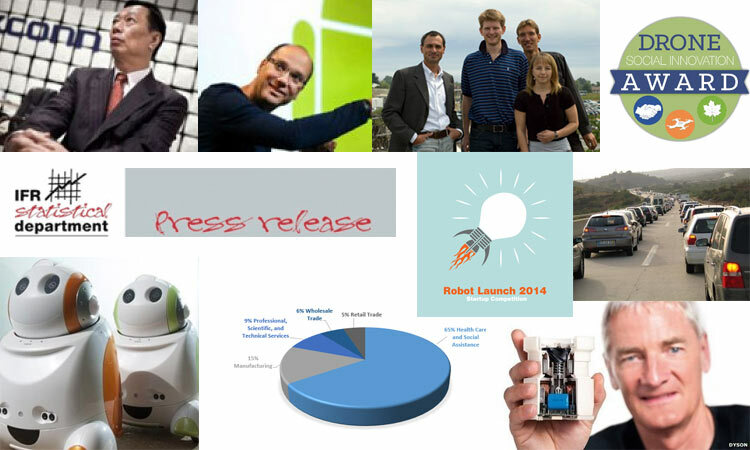 A Robohub Digest would not be complete without telling you about the new developments right here on our pages. February saw the launch of our global robotic startup competition in partnership with Silicon Valley Robotics. With this being the first ever startup competition exclusively focused on robotics, we are all very excited and look forward to the entries, so get your robot prototypes off the ground! If you’ve got a startup idea, make sure to submit your Round One entry by the 30th of March. We also launched the Big Deals series this month (still ongoing), to help shed light on why big companies like Amazon and Google are so interested in robotics right now. And last, but not least, we are proud to tell you that the bi-weekly Robots Podcast celebrated its 150th episode this month!